One of the last remaining office suites in the landmark 140 East development in Melbourne's Bourke Street has sold to a local finance company. The sale marks the second last for the Drapac-developed office tower comprising strata office lots ranging from 100m2 to 650m2. A local owner-occupier purchased the 280sqm site with vacant possession for $1.25 million. The sale, which comes one week after Burgess Rawson purchased level seven of the building, leaves the tower 98% sold, with just one suite remaining. CBRE’s Tom Tuxworth, who negotiated the sale in conjunction with fellow agents Ed Wright and Chris Pharr, said the property’s location was a key selling factor. “This suite is ideally situated with the iconic former Hoyts Cinema office tower, and located at the top end of Melbourne’s East End, which is home to several blue-chip office buildings, luxury international retailers, high-end hotels and renowned restaurants,” Mr Tuxworth said. Formerly known as the Hoyts Cinema Centre, this building comprised a 10 level office building with a cinema complex facing Bourke Street. In 2006, the site was purchased by Drapac Trust No. 2 for $14.4 million and was redeveloped in 2007 by Drapac into a state of the art Virgin Active Health Club; the first built in Melbourne. 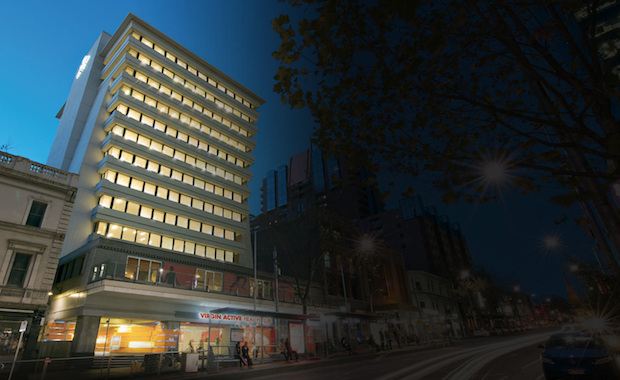 In 2011, Drapac commenced a major upgrade works program for the office tower. Mr Tuxworth said the majority of 140 East property owners were buying within their self-managed super funds to take advantage of the associated tax benefits.